Since there are many kinds of diamonds and diamond look alike gemstones available in the market, it is important as a consumer to know exactly what you are buying. A natural diamond is a mineral that is formed deep in the earth and comprised primarily of carbon. A synthetic diamond, which is also a mineral made from the same single element of carbon, is created in a lab by humans. Most synthetic diamonds are categorized as either high-pressure high-temperature (HPHT), or chemical vapor deposition (CVD) diamonds, depending on how they were made. HPHT and CVD diamonds are virtually identical to natural diamonds, the differences are only apparent when viewed by a trained grader in a gemological laboratory. A synthetic diamond is just as hard and durable as a natural diamond. As a gemologist, when speaking about natural v. synthetic diamonds, I always disclose that the key difference is how and where they are formed. The rise of synthetic diamonds in the market was not to fool people into buying a less valuable diamond. In fact, the cost required to manufacture synthetic diamond is so steep that the price does not make a significant difference. In addition, the current technology used to manufacture synthetic diamonds is still not advanced enough to produce large, gem quality diamonds like the earth can. Although there has been some success in the production of gem quality synthetic diamonds, the majority of commercial synthetic diamonds do not yield more than 1 carat in weight. The mass production of synthetic diamond material produced today is considered of ‘bort’ or industrial grade quality and can be used in technological industries such as medical devices. These industries don’t necessarily need high color and high clarity diamonds to benefit from the natural hardness and durability of a diamond. All other gemstones that look like a diamond but are not a diamond are called diamond simulants. Stones which fall in this category are cubic zirconia, synthetic moissanite, and white sapphire to name a few. These stones are often used to imitate the look of a diamond but their crystal and chemical composition differs from a real, organic diamond. Diamond simulants are typically much more affordable than both a diamond and synthetic diamond, but they differ in their hardness, durability, and optical properties. Consumers need to be careful when purchasing some diamond simulants because there are a few branded lines available which use the word diamond in it, but that are not true diamonds. When selling loose diamonds, it is imperative to always disclose whether a diamond is natural or synthetic. Many people mistake a synthetic diamond as not being a real diamond, which is a false statement. A synthetic diamond is just not a natural diamond. Gemological laboratories are highly skilled in distinguishing the differences between lab created and geologically created diamonds. Every diamond that enters a gemological laboratory is tested to determine if it is natural. At the Gemological Institute of America, if a diamond is found to be synthetic, a synthetic diamond grading report will be issued. 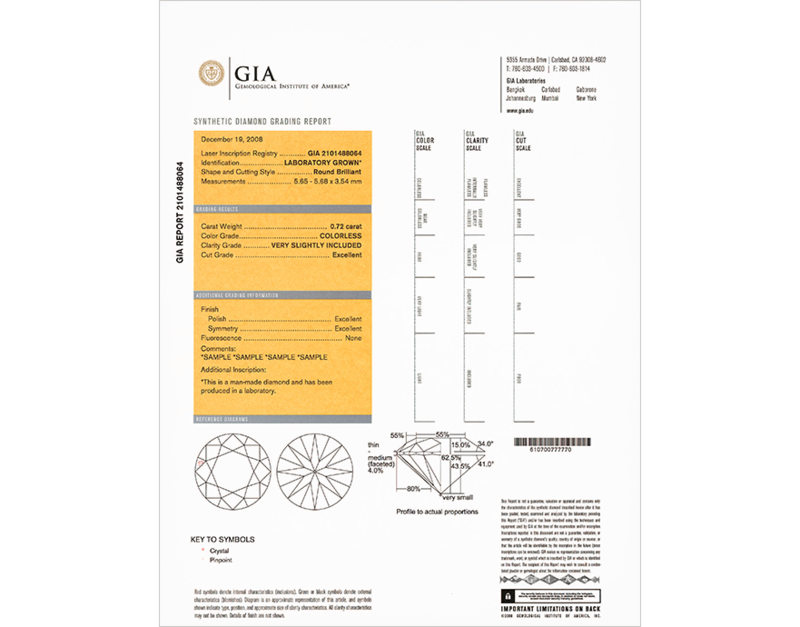 A GIA synthetic diamond grading report will look different from a standard grading report and every synthetic diamond which enters a GIA laboratory will be laser inscribed at the girdle with a report number and a statement that the diamond has been laboratory-grown. deBebians only sells natural certified and non certified diamonds. Please contact our gemologists if you have any further questions regarding natural loose diamonds vs. synthetic diamonds. We also have moissanite engagement rings featuring Forever One from Charles & Colvard.